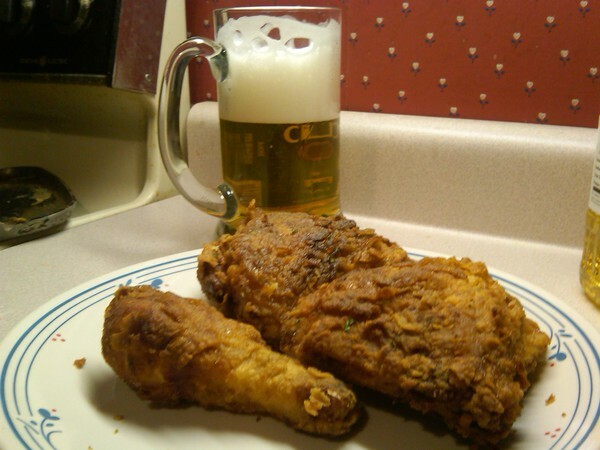 A little fried chicken and beer on a Friday night never hurt anyone right? I had no recipe going into it, just an idea of things I’ve seen or heard other people use. Here’s what I ended up using to create some pretty damn good chicken. I bought some chicken leg-theigh quarters and cut them into single pieces. While preparing the chicken, I filled a skillet with about an inch of vegetable oil and turned the burner to med/med-high. I then filled a bowl up with 2 cups of flour and then added some additional spices such as paprika, garlic, and onion powder along with pepper and salt. The rest is pretty simple, cover the chicken liberally in flour and add to the hot oil. Cook until they look like the picture on the right. Crunchy, unhealthy chicken, just the way it’s supposed to be. I sure enjoyed reading this, but really, so much grease! You don’t need that much! How did the stomach feel after that?